Exercise routines vary greatly from one rider to the next. Some riders believe in body weight exercises only, others in Olympic lifts, gym machines or systems like the TRX. The truth is, any strength exercise that engages your core is a good exercise, however, when focusing on what’s best for cycling, there are some common mistakes made. Olympic lifts with heavy loads in the 1-5 repetition range for cyclists does have its benefits but the window to work these is short and very early in the off-season. Lifting these loads for too long can have its drawbacks. Heavy lifting has always been a hotly debated subject for endurance athletes because it does provide benefits, such as recruiting more muscle fibers, developing stronger ligaments, tendons and a very strong core. The main drawback is the focus on anaerobic energy systems. Even the shortest of cycling races are mainly aerobic. Anaerobic efforts are a part of cycling, but that strength needs to be developed on the bike. Lifting in the gym is not the same as pedaling a bike, therefore only some of the gains made will transfer. When performing exercises like squats and deadlifts with heavy loads, you are powering the weight upward with both feet flat on the ground, for a few repetitions. 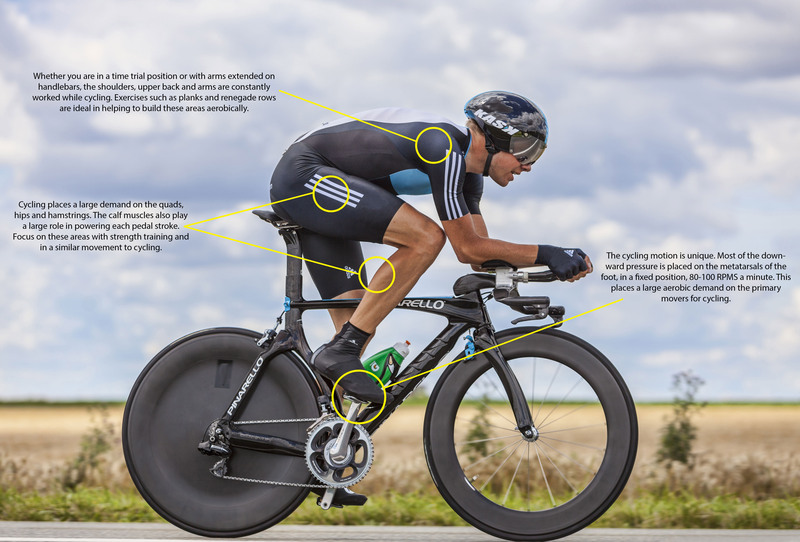 With cycling, all your weight is on the front of the foot as you spin the pedals 80 to 100 times a minute, for hours. Strength training aerobically will create a system that is more resistant to fatigue and clears waste products faster. If your core, arms and shoulders fatigue faster than your legs in a race, you will slow down. Focus the majority of your base training on higher repetitions, ranging from 15 reps per set up to 25 reps per set for two to four sets. Maximizing your time in the gym means working the most effective exercises for your sport. Dumbbell curls and lat pull downs are good exercises, but they are just not specific to cycling. A renegade row for example, is a more sport specific way to work your arms and back and at the same time. In the pre-season or off-season it is okay to be less sport specific, working a variety of exercises, but as you get into your base period, being more sport specific is wise. 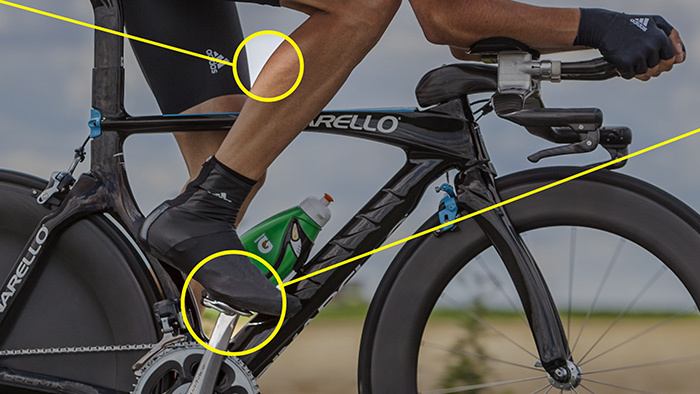 Cycling happens one leg at a time, with all the pressure placed on the metatarsals of the foot. Single leg exercises such as lunges and single leg deadlifts are a great way to be more specific to cycling. Single leg exercises also help correct leg strength imbalances. This exercise is very sports specific. Running steps requires you to propel from one step to the next off the front of the foot. It is also very aerobic. Light weight can be added to increase the difficulty. Start in a lunge with rear knee off the ground, using your arms to help you propel upward, jump from the lunge position, switching legs in the air and landing on the opposite side. Repeat immediately, spending as little time on the ground as possible. Using a platform/box that should be high enough that when stepping onto it, it creates a 90 degree angle at the knee, approximately 10 to 20-inches high. Place one foot firmly onto the platform and using that leg, lift both feet onto the platform. Repeat this, working one side at a time. Grasping the dumbbell will simulate holding the handlebar. Use dumbbells that will not roll for an easier version. Perform push-ups and mountain climbers this way. Other sport specific exercises include lunges, bicycle kicks and bent over rows. Too much strength training and you leave your legs and body sore and tired for the bike. Consistently training with low power output is going to train you to produce low power. You need days where you are fresh and strong on the bike, because the more often you can train at a high level of output, the more gains in cycling-specific strength you will make. Two or three days a week is ideal for strength training, spacing them with days off between. Spend one day, preferably early in the week, on a hard workout and the other days shorter and easier, focusing more on maintenance and flexibility. If you are looking to increase the difficulty of your strength training, instead of doing more, combine a strength day with a day on the bike, before and or after the ride. Targeting your strength training for the bike will motivate you more while in the gym. If you know that certain exercises are going to help you feel stronger on the bike, it’s motivating to want to complete those exercises. Keep the mistakes to a minimum, watch your form and listen to your body. More importantly, listen to how you feel on the bike to know that what you’re doing is working.